New diorama and display pieces from Battlefield Legends! We are pleased to offer the outstanding line of Build-A-Rama products. Hand crafted in the USA, this 3-piece solid resin sandbag wall section (1 straight section, 1 curved section, 1 corner section)) is well suited for use as a bunker, machine gun position or mortar position and will enhance any toy soldier display or diorama. Every Build-A-Rama piece is produced to the highest standards and painted by hand in 1:32 scale (54mm). New diorama and display pieces from Battlefield Legends! We are pleased to offer the outstanding line of Build-A-Rama products. 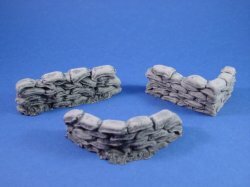 Hand crafted in the USA, this 3-piece solid resin sandbag wall section (1 straight section, 1 curved section, 1 corner section) is well suited for use as a bunker, machine gun position or mortar position and will enhance any toy soldier display or diorama. Every Build-A-Rama piece is produced to the highest standards and painted by hand in 1:32 scale (54mm).